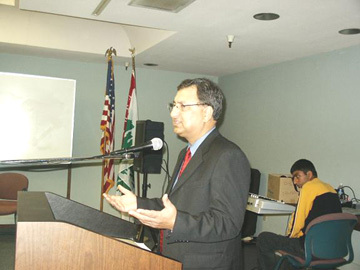 American Muslim Voice hosted an interfaith Eid dinner in Woodland, California on Saturday Nov.19, 2005. 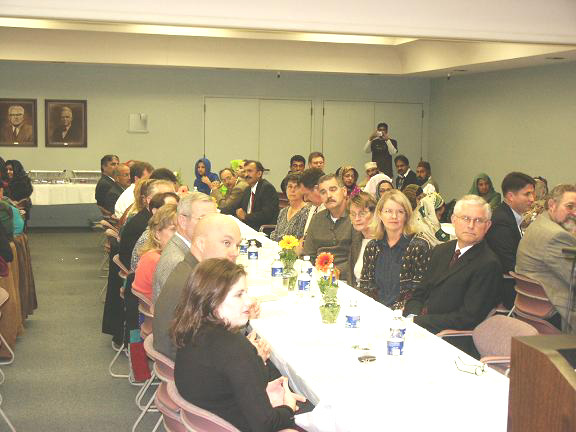 People from different religious and cultural backgrounds attended the dinner at the Leake Room of Woodland Library. The Program started on time at 6:30 pm with the traditional recitation of Holy Quran by Imam Tasawar Iqbal of Woodland Mosque. In the spirit of interfaith outreach, Christian, Jewish, and Muslim prayers were offered before serving the dinner. Joe & Steve Cohan of Davis Synagogue offered a Jewish blessing, Rev. Larry Love Joy said traditional Christian prayer and AMV President, Khaled Saeed offered Muslim prayer. Halal Italian dinner was served with special arrangements with “Strings Italian Restaurant” in Natomas, California. For desert Pakistani sweets (Jaleebees- Gulab Jamins- Maysoo) were served. Mr. Khalid Saeed, national president of American Muslim Voice, welcomed the guest and spoke about the significance of the two Eids and purpose of Eid dinners. He also recognized the notables among the guests. The clergy included Bishop Russel Spring; Father John Bole of the Holy Rosary Catholic Church; Rev. Larry Love; Rev. Brad Van Saint; Rev. Eileen Lindsey and Rev. Dr. William Marble. 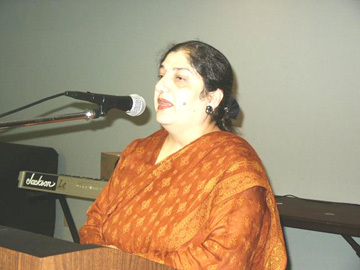 Among the prominent Pakistanis in attendance were: Pakistan American chamber of commerce president Mr. Arshad Whala; Businessman Mr. Tasawwar Ali Khan, Engineer State of California, Mr. Nasir Chaudhry; Mian Muhammad Anwar of Allstate Insurance; Imam Qari Muhammad Amin of Live Oak; Imam Tasawar Iqbal of Woodland; Qari Bashir Ahmad Sialvi of Woodland; Professor Zakia Isad from Bay area and Mr. Riaz Ahmad President Islamic Center Woodland. After Ms. Samina’s presentation, Mr. Tasawwar Ali Khan introduced the main speaker Dr. Michael Parenti, one of the nation's leading progressive thinkers, an uncompromising advocate for political and social justice. Dr. Parenti, who has written sixteen books, including Democracy for the Few, Dirty Truths, and The Sword and the Dollar, gave an enlightening speech with historical reference and termed US to be the current empire of the world . 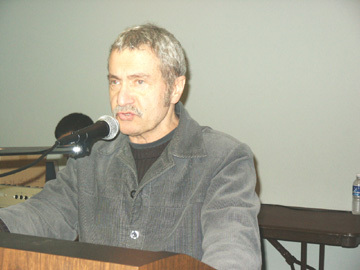 Dr. Michael Parenti spoke about the US involvement in Iraq and how all the reasons given to American people for going in did not prove to be true. He also talked about his research on the world empires and how they transitioned into monarchies. He gave the example of Roman Empire and expressed his fear of US going on the same path. He cited an example from his book about Julius Caesar and how the great Roman Empire transitioned into an autocratic monarchy. According to him, it was oil and no other reasons, as given by the administration, to go to War in Iraq. He was of the view that the US policies are hurting the world and its own people. The funds needed for the domestic needs are being spent on needless wars. There was a brief question answer session after the speech. After the speech, there were two electrifying rap performances. “Growing up as Muslim Youth in America” and “Pakistan earthquake” was rapped by Mr. Zaki Syed and Hannan Chaudhry rapped about the Eid and Ramadan. Program ended with a vote of thanks by Mr. Shahid Chaudhry, Northern California Director of AMV. The underlying theme of the Thanksgiving holiday is one that, perhaps now more than ever, Americans need to hear: We've got it good. I was thinking about this Saturday night at the Eid Dinner, sponsored by the Woodland Mosque. 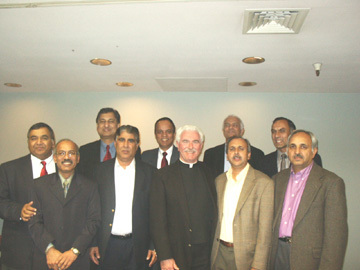 It was an interfaith dinner with representatives from a number of area churches and religions. The Eid Dinner celebrates the end of Ramadan in the Muslim faith. There were also a lot of other "common folk," political and community types in attendance. Particularly moving for me at the dinner was the recitation of the Quran by Imam Qari Tasawar Iqbal, which was followed by a Jewish blessing and then a traditional Christian prayer. All offered thanks to God for the meal and the ability to "break bread" with one another. Then there came the Eid Dinner and an overpowering sense of togetherness. When you think about it, despite the tragedy which hits us daily - both locally and internationally - we are blessed with a bountiful country. We are a hard-working people and with a strong democratic history. Ours is an existence for which most people throughout history would gladly have given anything. That's a humbling statement of fact, not a boast. For whatever reason, we who call ourselves Americans have the good fortune of living in the freest, most prosperous nation in the history of the world. We have it good, all right. So good that we too easily take it for granted. Unlike the original Pilgrims, for whom a successful harvest made the difference between death and survival, one of the most pressing health problems of our day is obesity - a problem that is, amazingly, pronounced among the poorest of Americans. That is, even the poorest among us have too much to eat, so much that we throw tons of food away every day, even as others starve around the world. Our health care system is plagued by a similar "problem" - we're living too long. That's why the system teeters on the brink of insolvency. Americans are living longer, healthier lives than ever before, thanks to technologies that are miraculous but also expensive. And although our nation is at war, this, too, is an odd reflection on our good fortune. Terrorist radicals have set their sights on America precisely because of our cherished liberties. This Thanksgiving, we can be grateful not only for our freedom, but also for the brave men and women fighting and dying to protect it, regardless of how you feel about the war itself. There are, to be sure, many problems and crises facing our cities, states, nation and world. And one of the best ways to show our gratitude for all that's good is to work constructively to address the weaknesses, iniquities and challenges of our age. The Eid Dinner helped reaffirm that within me - and hopefully others. But gratitude also requires that we not lose sight of the bigger picture. By almost any measure, we've got plenty for which to be thankful - starting with our very lives, our families, and the friends and loved ones who celebrate this holiday with us. I thought about some of this while having dinner and watching the people of different faiths around me talking, laughing and sharing themselves. We all have so much in common in this country that it's often easier to find our differences. For all these good things, we should be giving our thanks on Thanksgiving. Jim Smith is editor of The Daily Democrat, Woodland, Calif.